Grease a 9 inch springform pan and line with parchment paper. Heavily grease the parchment paper. Melt the chocolate and butter together in a medium heavy saucepan over medium heat, stirring occasionally. Remove from heat and cool to room temperature, stirring occasionally. Beat the egg yolks and 1/3 cup sugar in a large bowl for three minutes, or until the mixture thickens and turns a pale yellow. Fold the chocolate mixture and vanilla into the egg yolk mixture and set aside. Using very clean beaters and a clean bowl, beat the egg whites until soft peaks form. Add the remaining 1/3 cup sugar and beat until medium-stiff peaks form. Carefully fold the egg whites into the chocolate mixture a quarter at a time, until all of the egg whites have been added and the batter is uniform in color. Do not overmix. Spoon the batter into the prepared pan and smooth evenly. Bake for 50-55 minutes, or until a cake tester comes out with moist crumbs rather than batter. Cool the cake thoroughly in the pan (the cake will fall dramatically). Remove the cake from the springform pan and place on a serving plate. Beat the heavy cream with the sugar and then spoon into the center of the cake. Top with the raspberries and refrigerate for up to 12 hours, or serve immediately. Try the recipe for the orbit cake in the Scharffenbeger semisweet baking bar. The original recipe appears in Room for Dessert by David Lebovitz (a GREAT baking book) It’s one of the best flourless chocolate cakes ever. Gild the lily with whipped cream and raspberry puree. This looks great and a treat for Passover. 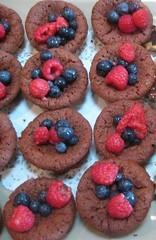 Right now, I am posting flourless brownies, cakes and cookies on my blog. You reminded me, I should mention their appropriateness for the holiday. How much sugar? I see that the 2/3 cup you called for in the cake has already been allocated. Thanks.